U is for … Unrecognizable Male Face! I had a very challenging time trying to find something for the letter U that gave me the urge to pick up a pencil. After hours raking the Internet, I finally remembered a singer who’d make an interesting subject. And tried to draw him. And should really scrap this and start again. But I liked the drawing. You won’t be able to recognize him, but it took me an hour and a half to get it this far and I don’t wanna rush the do-over. Maybe by the time I come back to the letter U next month, it’ll be ready. And hopefully you’ll recognize him then. Bonus points for anyone who guesses who he is. Plus, my undying gratitude, and you can’t really put a price on that, can you? I used the brown ochre Polychromos for this one, and I do like the color and wouldn’t change that when I try it again. I’m finding I really enjoy portraits. The whole human figure feels like a bit of a stretch, but I like faces, and would like to draw more of them, because if you think about it, there are so many people it would be fun to draw! Looking forward to drawing a flower for tomorrow’s post. Maybe we can conjure up an early spring! I hope you are making something today. ‘Twill feed your soul, I promise. See you tomorrow. < T is for Tweety! Yes ma’am! Way to go! I was, but I haven’t watched it in a few years…..did you hear what happened to Michael Johns?? I was stunned. But yeah, I think Idol is a great show. I’d say that is really good. I struggle so with nose and eye and brow. I might study how you did that. Good effect. I did too, for years and years. The key for me is no lines. Shade instead. I try to avoid lines wherever possible. And the Polychromos is great for that too. They are available open stock. I meant to tell you that before. You can buy one pencil and try it. Also if you order from dickblick.com, then you can always return for any reason within 30 days, even if you opened and used the product. Good luck! No lines–I’m going to work up the courage to try that. We’ve got a Blick just down the street. I go there often. Oh gosh. I’d be in bankruptcy court if I had one close by. 🙂 I’m looking forward to watching your progress! Well, I know who it is…Keith Urban…but I did see a hint out there but it doesn’t matter. 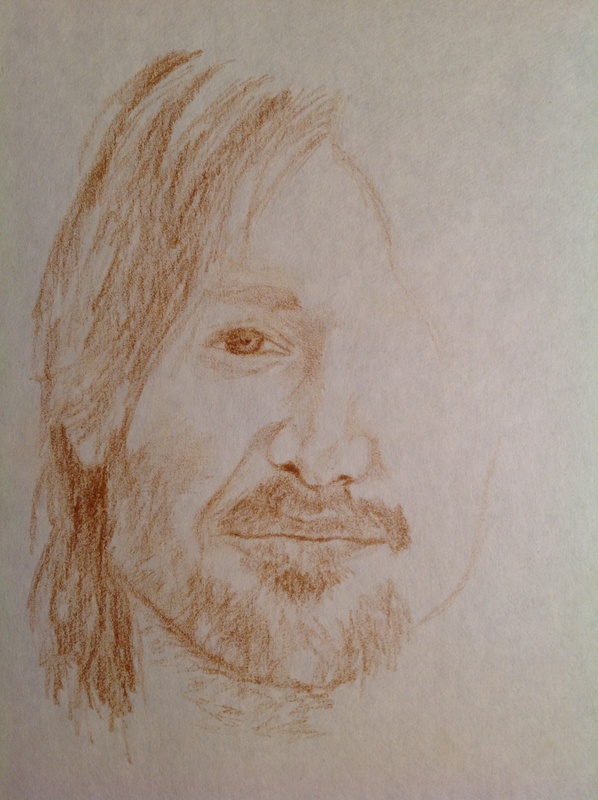 I think it really looks like him and had I not had the hint, and had I actually really knew Keith Urban’s face, I would have been able to guess it. Well done! oh, and I like how you only did a portion of the face. I think it looks really awesome that way. You’re on the right track. Don’t abandon this portrait. Keep working on it, slowly but surely. Thank you for the compliment. I didn’t post the reference photo, but if you go to google images, you’ll see it at the top of the screen if you use Keith urban as the search term. I need to widen his lower face and the whole mouth is crooked. I can erase those Polychromos pencils but I feel like I’d have to erase enough that I probably need to scrap it. But even though it doesn’t really look like him…for some reason I just like this one and I’ll probably always keep it. I really would like to keep trying more portraits. I enjoy them.